If you don’t know who Gary Vaynerchuk is, you must’ve been hiding under a rock. Founder of fast growing marketing agencies Vayner X and VaynerMedia, Gary grew his family’s wine retail business from US$3 million to US$60 million in sales in 5 years, largely through online channels like WineLibraryTV. Author of many bestselling books, including Jab, Jab, Jab, Right Hook and The Thank You Economy, Gary Vee has tens of millions of followers on social media channels – from Facebook, Twitter, LinkedIn and Instagram to YouTube and SnapChat. He is also a popular speaker who is highly sought after for his outrageously frank (and often expletive-laden) views. 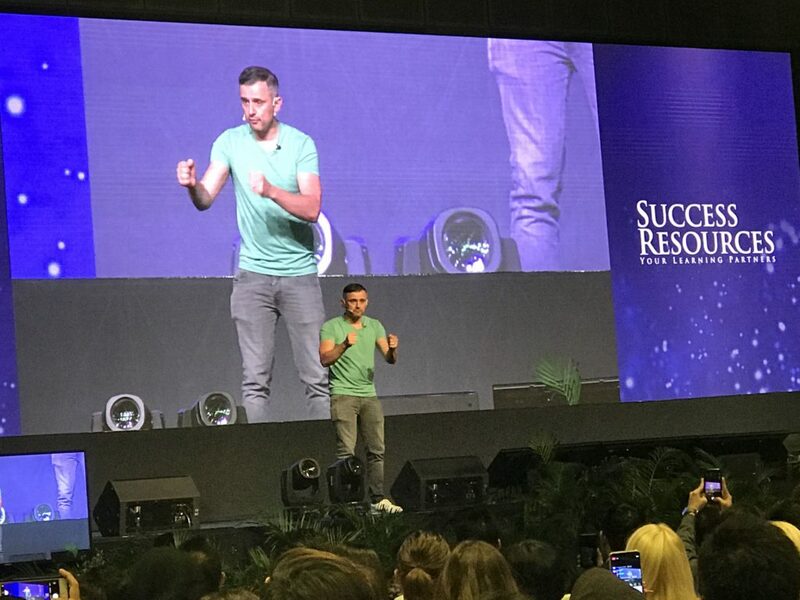 Speaking at the National Achievers Congress 2018 in Singapore, Gary shared some of his thoughts in his characteristic style (with lots of “F” and “S” bombs thrown in). In case you missed it, I jotted down lots of notes from his session, and have distilled them into the following lessons. First, you need to be self aware. Know what is “the thing” which is driving your ambition. Who the h*** are you? What itch are you trying to scratch? Who are you playing the game for? Why do you wish to be successful? And for whom? In Gary’s case, he only talks about the stuff which he understands. While he doesn’t wish to be a motivational speaker, the reason why he does “ra ra” content is to give value to his audiences. Invest in Social Media Ads. Now. The window of opportunity in South East Asia (SEA) is now. And the best way to win in this game is to start doing social media ads. Relating his own experience in building Wine Library using Google AdWords and emails in 2004, Gary recommends that we spend enough on social media ads on Facebook and Instagram to get traction. Its still affordable right now, but certainly won’t be so a few years from now. PS – Gary’s team at VaynerMedia ran hundreds of millions of dollars on ads that worked. And hundreds of millions of dollars on ads that didn’t work. That’s how he and his team learned. The single most important thing now, according to Gary, is the smartphone. Everybody is converging around their devices – adults, youths, grandparents, kids and even their dogs and cats. “If you are not successful on Facebook, Instagram, SnapChat, Twitter, LinkedIn and YouTube, you are becoming irrelevant. Put on some real hours to figure this thing (smartphone) out,” implored Gary. To do so, you’ll need to regularly produce content so that you can build a community. Make it a part and parcel of your everyday life. Do the hustle. … Unless he has personally experienced how its like to run a business. Neither should you bother about an anonymous troll who wrote a negative comment on your Instagram post. You either listen to your own voice. Or you listen to somebody else. Unfortunately, too many of us value the opinions of others around us too much. Relating a particular scene in Rocky IV, Gary shared how the Russian boxer (Ivan Drago played by Dolph Lundgren) cracked after the stress of fighting for the entire Russian nation got to him. He then retorted that he was fighting the game for himself, and not for anybody else. Likewise, you need to still the naysayers and negative voices that are stopping you from doing your life’s work. Just drop your name, company, email address and contact here. Gary works 17 hours a day. He is constantly sharing content on all his social channels. He has a team of people following him wherever he travels to keep him on his toes. Surprisingly though, he isn’t on social media to make a lot of money (though he certainly has some). Rather, he values the game and the admiration which social media proffers. He wants people to hear him, and then go and do their own thing. He’ll be happy if they unfollow him thereafter. Which is why he doesn’t usher his listeners, viewers or readers into a funnel to sign up for courses or masterminds. Have a look at how he readily offers advice on his super popular YouTube Channel AskGaryVee. Like Gary Vee, I provide tonnes of marketing tips, techniques and advice here on Cooler Insights. While I do have occasional Call To Actions (CTA) on my articles, I find it awkward to market myself. Despite this, I still get lots of invitations and leads to conduct paid training, consulting, and agency services. Attention is the most important currency in the perpetually distracted digital age. Its the currency we have to make anything happen around the world. And the action has shifted away from radio, TV and newspapers to the smartphone. Don’t give yourself excuses such as “I am a perfectionist.” Or make the mistake of allowing your personal opinion of the smartphone or Facebook to dictate how you should run your business. Who knows, if you start doing it, you’ll begin to see results on social media. Just like me. What are your thoughts on what Gary Vee has to say about social media and entrepreneurship? Do you agree with his radical (and sometimes outrageous) views? PS – VaynerMedia will be opening their office in Singapore (as a SEA HQ) in the 1st quarter in 2019! I’m looking forward to see what they can do here. Hello. I see that you don’t update your page too often. I know that writing posts is time consuming and boring.